When and How Did World War II End? World War II in Europe ended with the unconditional surrender of Germany in May 1945, but both May 8 and May 9 are celebrated as Victory in Europe Day or V-E Day. 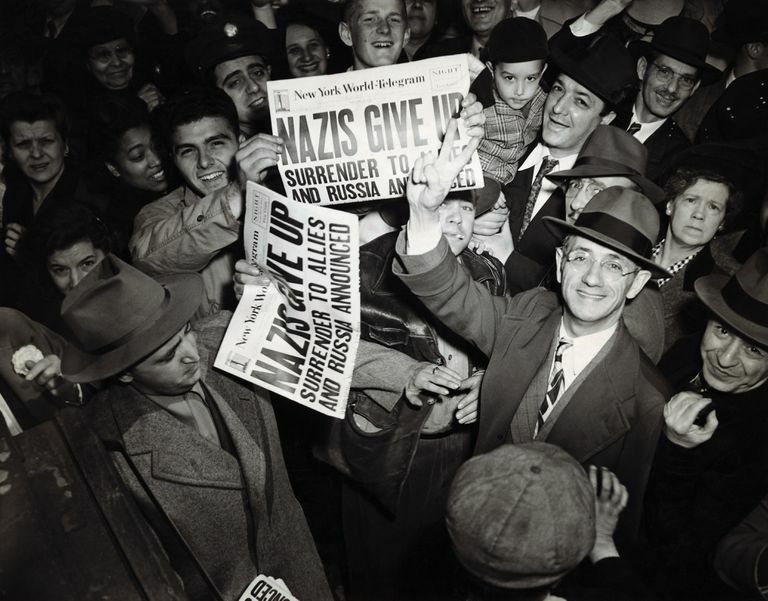 This double celebration occurs because the Germans surrendered to the Western Allies, including Britain and the U.S., on May 8, but a separate surrender took place on May 9 in Russia. In the East, the war ended when Japan surrendered unconditionally on Aug. 14, 1945, signing their surrender on Sept. 2. The Japanese surrender occurred after the United States dropped atomic bombs on Hiroshima and Nagasaki on Aug. 6 and 9, respectively. The date of the Japanese surrender is known as Victory Over Japan Day, or V-J Day. Within two years after starting the war in Europe with his invasion of Poland in 1939, Adolf Hitler had subjugated much of the continent, including France in a lightning-fast conquest. Then Der Führer sealed his fate with a poorly thought-out invasion of the Soviet Union. Stalin and the Soviet people did not concede, although they had to overcome initial defeats. Soon, however, the overextended Nazi forces were defeated at Stalingrad and the Soviets began to force them slowly back across Europe. It took a long time and millions of deaths, but the Soviets eventually pushed Hitler's forces all the way back to Germany. In 1944, a new front was reopened in the West, when Britain, France, the U.S., Canada, and other allies landed in Normandy. Two enormous military forces, approaching from the east and the west, eventually ground the Nazis down. In Berlin, the Soviet forces were fighting their way through the German capital. Hitler, once the charismatic ruler of an empire, was reduced to hiding in a bunker, giving orders to forces that only existed in his head. The Soviets were getting close to the bunker, and on April 30, 1945, Hitler killed himself. Command of the German forces passed to Adm. Karl Doenitz, and he quickly sent out peace feelers. He soon realized an unconditional surrender would be required, and he was ready to sign. But with the war over, the tenuous alliance between the U.S. and the Soviets was turning frosty, which would eventually lead to the Cold War. While the Western Allies agreed to the surrender on May 8, the Soviets insisted on their own surrender ceremony and process, which took place on May 9, the official end to what the USSR called the Great Patriotic War. Victory and surrender would not come easily for the Allies in the Pacific Theater. The war in the Pacific had started with the Japanese bombing of Pearl Harbor in Hawaii on Dec. 7, 1941. After years of battles and unsuccessful attempts at negotiating a treaty, the United States dropped atomic bombs on Hiroshima and Nagasaki in early August 1945. A week later, on Aug. 15, Japan announced its intention to surrender. The Japanese foreign affairs minister, Mamoru Shigemitsu, signed the official document on Sept. 2.